Many Christians have gotten into the habit of sleeping in on Sunday mornings, or going fishing, or staying home to watch TV, or doing anything other than attending church. Or, when they do attend, it is just out of "obligation." They are not really there to worship, or to see how they can be in service for the Lord. I know there is no rule that says you MUST attend church in order to be a Christian. 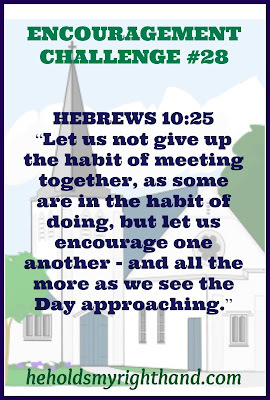 However, we can see in the verse above that it is an encouragement to ourselves and to others when we do. 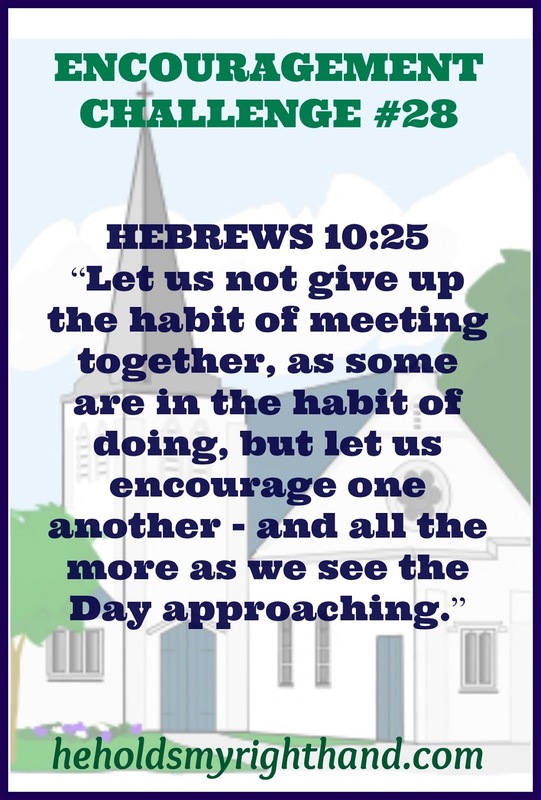 Do you have a desire to be an encouragement to other Christians? If so, then consider attending a church or a Bible study in your area (or even online if you are unable to leave the house). Your presence in a place of worship is encouraging to others, including the leaders. It also helps others there with you to know they are not alone. YOU can make a difference in someone's life, just by being present and attentive. Do you have a need to BE encouraged? Again, consider attending a church or Bible study. When you open up to other like-minded individuals about your burdens and cares, they can come along side you, pray with you, and give you support through the difficult times. If you are not already involved in a church, choose a place of worship to attend next Sunday, or find a Bible study to attend that fits in with your schedule. Some churches have Sunday evening or Wednesday evening services also. Consider attending one of those if you want something a little more laid back. If you ARE already a part of a church or Bible study group, but you don't attend on a regular basis, make a commitment to show up for the next 4 weeks in a row. And don't just show up, but also be present and attentive to the needs of others. If you are already a regular attender, make it a point to ask yourself, "What can I do for the people around me?" rather than asking, "What can these people do for me?"